This article is about the exercise equipment. For the piece of body piercing jewellery, see Barbell (piercing). Not to be confused with Barbel (disambiguation). Barbells range in length from 1.2 metres (4 ft) to above 2.4 metres (8 ft), although bars longer than 2.2 metres (7.2 ft) are used primarily by powerlifters and are not commonplace. The central portion of the bar varies in diameter from 25 millimetres (0.98 in) to 50 millimetres (1.96 in) (e.g. Apollon's Axle), and is often engraved with a knurled crosshatch pattern to help lifters maintain a solid grip. Weight plates slide onto the outer portions of the bar to increase or decrease the desired total weight. Collars are used to prevent plates from moving outward unevenly so that the lifter does not experience uneven force. A men's Olympic bar is a metal bar that is 2.2 metres (7.2 ft) long and weighs 20 kilograms (44 lb). The outer ends are 50 millimetres (2.0 in) in diameter, while the grip section is 28 millimetres (1.1 in) in diameter, and 1.31 metres (4.3 ft) in length. The bars have grip marks spaced 910 millimetres (36 in) apart to allow intuitive grip width measurement. It is the standard used in competitive weightlifting where men and women compete at the highest level - the Commonwealth Games, Pan-American Games, World Championships, and the Olympics. Bars of this kind must have suitable "whip" (ability to store elastic energy) and sleeves which rotate smoothly, as well as the capacity to withstand multiple dropped lifts from overhead. A women's Olympic bar is similar to the men's bar, but is shorter - 2.01 metres (6.6 ft) - and lighter - 15 kilograms (33 lb) - with a smaller grip section diameter (25 millimetres (0.98 in)). Also in contrast to the men's bar, the women's bar does not sport a center knurl. Powerlifting utilizes the same bar for both male and female competitors. Weight plates used in Olympic lifting, which are often termed "bumper" plates, need to be able to be safely dropped from above head height and as such are coated in solid rubber. General strength training or powerlifting plates are made from cast iron and are considerably cheaper. 50 kilograms (110 lb) green bumper plates were only officially approved for use by IWF from 1976 to 1980, Montreal being the only Olympic venue where they were deployed. Presently, Olympic plates of 10 kilograms (22 lb) or more are 450 millimetres (18 in) in diameter. 450 millimetres (18 in) versions also exist of the lighter 5 kilograms (11 lb) and 2.5 kilograms (5.5 lb) plates to accommodate the proper starting position for beginner athletes. These can be aluminium or plastic and may have rubber edges. As a general rule, powerlifting requires use of stiffer bars to better accommodate the heavier weights being used in the sport. The deadlift barbell is usually the longest, thinnest and the most flexible, thus allowing more weight to be lifted. Powerlifting barbells use simpler, more robust bushings because they do not need to rotate as fast as Olympic weightlifting barbells. Sometimes the sleeves of powerlifting bars are also extended. Additionally, powerlifting bars have their grip marks spaced closer, at 810 millimetres (31.9 in). This closer spacing is used to check legal grip width in the bench press. The International Powerlifting Federation requires using strictly the same kind of bar on all lifts, being between 28 millimetres (1.1 in) and 29 millimetres (1.1 in) in diameter, not more than 2.2 metres (7.2 ft) in overall length, and between 1.31 metres (4.3 ft) and 1.32 metres (4.3 ft) between the inner faces of the collars. Another visual difference from typical Olympic bar or IPC approved one is that the IPF bar's knurling shall not be covered by chrome. Stating that bar should weigh 25 kg (55 lb) with collars on, effectively permits use of 20 kg (44 lb) bars only, because same as IWF, IPF requires collars to weigh 2.5 kg (5.5 lb) each. The total weight of the barbell varies based on the type and number of plates loaded onto the ends of the bar and the lift being performed, and easily can be 540 kilograms (1,190 lb) or more with squat dedicated bar (which itself can weigh up to 29 kg (65 lb) and have up to 35 mm (1.4 in) grip section diameter). Additionally, differently coloured plates are or were used outside of IWF sanctioned competition, most prominently in powerlifting. Powerlifting plates in contrast to Olympic lifting ones are usually thinner (to accommodate more plates on bar) and as they are not meant to be dropped, do not need to utilize additional coating. 100 pounds (45 kg) plates are fairly rare, typically only used in some of the powerlifting federations still using plate sets scaled in pounds, such as IPA, SPF and their affiliates. Black 50 kilograms (110 lb) polyurethane coated plates were introduced by Eleiko in IPC sanctioned London 2012 Paralympic Games. Apart from them and 0.25 kilograms (0.55 lb) record discs, IPC approved set uses the same plates as IWF one. Technically, 10 kilograms (22 lb) and smaller plates can be of any colour in IPF approved sets, although only colours listed above were used for them by few certified manufacturers. Most "Olympic" bars one can see in commercial gyms, although superficially similar to real Olympic bars to the untrained eye, do not share IWF or powerlifting essential characteristics. They are just generic strength training bars, with wide variations in markings, grip section diameter, and, most importantly, stress capacity prior to permanently bending or dangerously failing. In general-use gyms, weight plates are typically all one color/finish, and may be of any diameter. Standard collars can be of any material, usually metal, and they can weigh up to 2.5 kilograms (5.5 lb) each for both men and women. 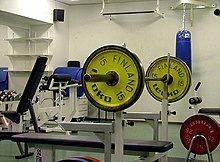 Typical Olympic bar with a pair of collars, the plates not counted, can weigh as much as 25 kilograms (55 lb) for men and 20 kilograms (44 lb) for women depending on the collars. This barbell was produced by the company Berg in 1910, but designed by Veltum. This was a major turning point in Olympic lifting as the barbell was able to revolve easily during the lift. After the Olympic games in 1928 Amsterdam, the barbells began to become popularized and many companies started to copy the barbell. The Berg barbell and copies of it were spread through many gyms around the world mainly from the 1960s to the 1970s because of the rise of a new barbell. Despite the name, "standard" barbells have little in common with one another, dimension wise. In contrast with the 50-millimetre-diameter (2.0 in) rotating sleeves of Olympic bars, which mount plates with a larger than 50 millimetres (2.0 in) center hole, the ends of standard bars do not rotate, and mount plates with an approximately 25 millimetres (0.98 in) center hole. The thickness of the grip section is most commonly 1 1⁄16 inches (27 mm) in the United States or 28 millimetres (1.1 in) in Europe, but can be slightly thicker or thinner, depending on quality. Neither bar weight nor length is standardized like men's or women's Olympic bars, and can range from 1.22 metres (4.0 ft) to 2.16 metres (7.1 ft). They are rarely rated for more than 500 kg (1,100 lb) of loading. Dumbbells are the equivalent of one-handed barbells, with a gripping surface approximately 16 centimetres (6.3 in) and a total length that rarely exceeds 50 centimetres (20 in). Adjustable dumbbells are the most prominent use of "standard" weight plates (those having a 25 millimetres (0.98 in) center hole). Originally known as a Dymeck curling bar after its inventor Lewis G. Dymeck, the EZ ("easy") curl bar is a variant of the barbell that is often used for biceps curls, upright rows, and lying triceps extensions. The curved profile of the bar in the grip region allows the user's wrists and forearms to take a more neutral, less supinated position. This reduces the risk of repetitive stress injury in these exercises. However, when performing the biceps curl, using an EZ curl bar prevents full contraction of the biceps-which can only occur with the wrist fully supinated-and thus may prove a less effective exercise. Primarily found in gyms, these are usually fairly short bars with weights already attached and welded to the bar, and in some cases, a covering of plastic/rubber around the plates. A typical gym might carry a range of fixed barbells from 5 kilos to around 40 kilos. They are handy as they take less space than full-length bars and are useful for many exercises where less weight is required. They can also provide an easier starting point for beginners before moving on to using the full olympic bars. In addition, they provide for speedy transitions between various weights if one is doing multiple weights in quick succession. These specialty items are designed to challenge the grip. They're used in strongman competitions for the deadlift and overhead presses, such as Apollon's Axle. Recently, even such exotic as 76 millimetres (3 in) diameter bars appeared, however their practicality could be disputable. They are made in China, and can weigh up to 61 kilograms (135 lb). Similar in function to an EZ curl bar, the triceps bar consists of two parallel handles mounted in a cage. It is used to perform triceps extensions and hammer curls. A hexagon-shaped bar in the middle of which the user stands and grasps the bar, via side handles, with a neutral grip. The use of trap bars places the center of gravity closer to the lifter. Trap bars are used primarily for performing deadlifts and shrugs. An Atlas Bar is an ergonomic grip structure that consists of parallel bars that are closely spaced together. An Atlas Bar can take the form of a barbell, dumbbell, cable or machine attachment. The parallel bars are closely spaced because they are joined by join plates and not by any grips or handles. This creates a narrow hand insertion space where the user can only use a prone or supine grip. The user may grip one bar while the other rests on their forearm below their wrists. This grip style keeps the users locked in a straight position and increases tension in the targeted muscles while reducing wrist strain. This device may also be used to perform squats as well. The bars may be used for training and for rehabilitative purposes because of their ergonomic structure. Wikimedia Commons has media related to Barbells. ^ "Pickyguide Guide to Barbells". Pickyguide.com. Archived from the original on 17 April 2009. Retrieved 2009-04-23. ^ a b c d "IPF Technical Rules Book 2012" (PDF). IPF Technical Rules Book 2012. International Powerlifting Federation. Archived from the original (PDF) on July 10, 2012. Retrieved September 10, 2012. ^ Dresdin, Archibald. "Weightlifting Equipment Through The Ages". Lift Up. Retrieved September 10, 2012. ^ "2011-2012 IPC Powerlifting Rules and Regulations" (PDF). 2011-2012 IPC Powerlifting Rules and Regulations. IPC Powerlifting. Retrieved June 12, 2012. ^ "Eleiko Disability Competition". Eleiko Disability Competition. Eleiko. Retrieved December 10, 2013. ^ "Ivanko on Olympic Bars". Ivanko on Olympic Bars. Ivanko. Retrieved September 15, 2012. ^ "The History of the Olympic Barbell". Physical Culture Study. 2018-02-12. Retrieved 2018-02-22. ^ "Common uses of the ez curl bar". Retrieved 2009-04-25. ^ "What is an EZ Curl bar?". Archived from the original on 2011-01-31. Retrieved 2010-09-17. ^ Rippetoe, Mark. "Platform: The Lying Triceps Extension". The Aasgaard Company. Retrieved 22 April 2012. ^ "New York Barbells Special Fat/Grip Bars". New York Barbells, Elmira. Retrieved September 20, 2012. ^ "Types of barbells used in weight training". Archived from the original on 3 November 2009. Retrieved 2009-11-15.